Helping your clients reduce cost, mitigate risk and improve agility; Estimates say that data volumes will grow 44x in the next ten years. Smarter computing solutions from IBM can help you store this data more efficiently. With IBM data protection and retention solutions you can safely store big data - back it up, archive it, get access to it when you need it for day-to-day business decisions, audits or disaster recovery. IBM data protection and retention solutions support automation, integration, high performance to help you improve your data security, data recovery and compliance. Browse the brochure for additional information regarding archiving and retention solutions from IBM. 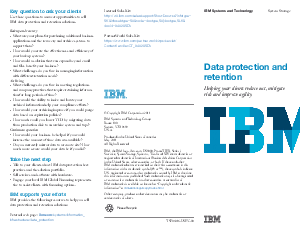 Take a look at this flier for additional information regarding archiving and retention solutions from IBM.